DWoods sent the Grandpa Peabody proj, and we just missed it! Shite! The Process, 8C+…atleast there’s whiskey. The Process is now a complete line that continues beyond the finish of the existing problem Blood Meridian (V13) to add a V14 crux and a V10 lip encounter that occurs quite a long way from the ground. No word from Woods on the grade just yet, but the internet is pretty sure this problem is V16 so it will be interesting to see what he has to say about it. Last night Daniel Woods took down what he's now calling "The Process". 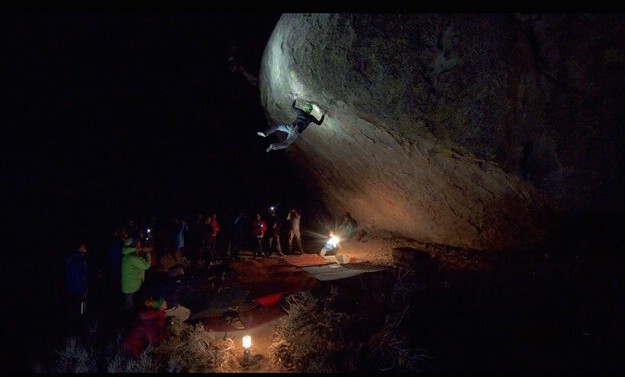 The mega-proj on the Grandpa Peabody boulder has been slayed and our man @krimdogbillionaire was there with a few other videographers to capture the magic for a larger piece for @reelrock @senderfilms and @bigupclimbing First the #DawnWall now the #megaproj What's next!? I hope Dan Beall sends too! Is there anything this guy cant send? With regards to “next level” projects… what are they? I remember the so called Invisible Man project from Hueco, and another that “9A” thing in Europe associated with Dave Graham. Are there any other well known ones that I’m forgetting? Is The Island even climbable from the beginning? Has anyone tried it? The Island from the beginning is The Big Island, I don’t think the sit start to The Big Island has been done yet. The Big Island is from the middle of the boulder, The Island is two moves in. I was asking if it’s climbable from a sit start. 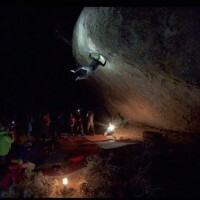 There’s a comment about it from Nalle somewhere, I believe he said “8C+ for sure” or something along those lines. The moves of the Big Island sit start have all gone, it is proposed to be 8b/+ to the start of the Big Island, which is the standing start, from the ground, on an obvious rail. The Island starts squatting on the boulder behind the problem, with a toe-hook in place and one hand high, one low.